After nearly 2 years I've finally gotten into the scrapping thing again. My insperation was gone and I didn't quite have the patience to sit down and scrap. After actually forcing myself to sit down and give myself a break I've finally gotten into the swing of things. After a couple of tough years a pretty ugly divorce and trying to get back on my feet my mare was with me the whole way! Shes my diamond in the rough! I used the left side of the sketch. Stunning layout! Glad you have found your way back to scrapping! What an absolutely gorgeous pic of you and that gorgeous horse of yours. (Yes, I am a horse girl) Thank's for playing along with us at Let's Scrap! Oh wow stunning layout! I am glad I could inspire you to take part in my challenge. The best therapy for any situation is scrapping, so I am very glad you are back in the saddle! What a beautiful layout.. 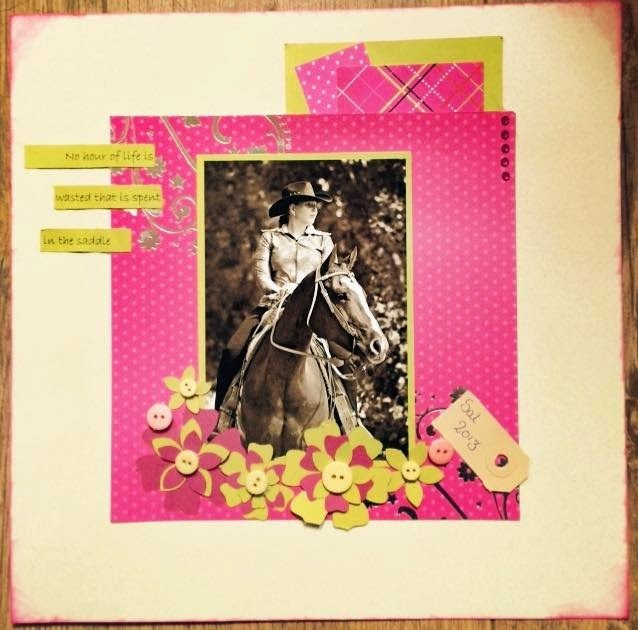 I'm glad you are back scrapbooking again and are playing with us at Let's Scrap Sketches! !